Mastering the implementation and management of a Quality Management System (QMS) based on ISO 9001. This five-day intensive course enables participants to develop the necessary expertise to support an organization in implementing and managing a Quality Management System (QMS) based on ISO 9001:2015. This training is consistent with the project management practices established in ISO 10006 (Quality Management Systems - Guidelines for Quality Management in Projects) and it is based on the quality management principles described in ISO 9000. Participants will also gain a thorough understanding of best practices used to implement quality processes that will address risks and opportunities and thus lead to the improvement of the overall performance and the basis for a sustainable development. Moreover, this training is fully compatible with ISO 9004 guidance's (Managing for the sustained success of an organization - A quality management approach). 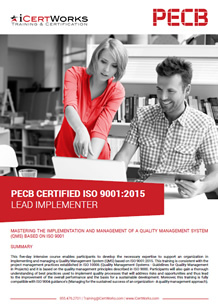 Contact us about ISO 9001 Lead Implementer Training!